CommunityGrows Summer Program is well underway with cooking at Hayward Recreation Center. On Monday, June 17th, pizza was on the menu. Adrian Almquist led the group in making the dough for the pizzas, while Adrian Gaino, our Cooking Instructor kept the youth chopping away, slicing and dicing vegetables. Venyse Sims and Barbara Nguyen, two of our BEETS interns, joined volunteer-extraordinaire Frances Bradley to help keep everything under control. After choosing their favorite veggie toppings, everyone helped assemble the pizzas for the oven. 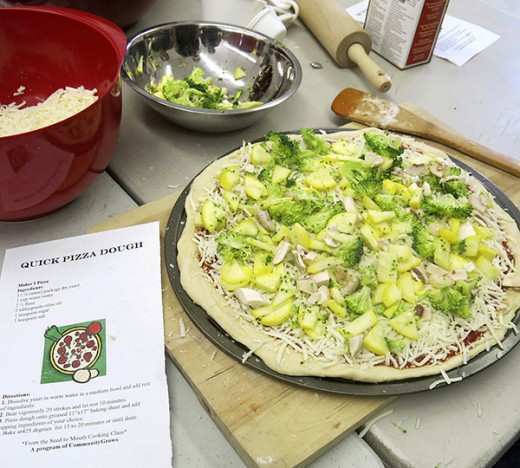 Here’s our CommunityGrows Quick Pizza Dough recipe. Enjoy! 1. Dissolve yeast in warm water in a medium bowl and add rest of ingredients. 2. Beat vigorously 20 strokes and let rest 10 minutes. 3. Press dough onto greased 11″x17″ baking sheet and add topping ingredients of your choice. 4 Bake at 425 degrees fro 15-20 minutes or until done.